Other Information: Sodium content: 54 mg/tablet; store at room temperature; Misc: Doctor recommended. For relief of upset stomach including nausea. Prompt relief. No aspirin. No salicylates. With Electrolyte-S-10 (Electrolyte-S10 is Alva-Amco's trade name for sodium citrate dihydrate). 4 minute formula (in laboratory tests, Nauzene reaches 99% of its acid neutralizing ability within 4 minutes). Contents sealed (each round pink Nauzene chewable tablet bears the identifying mark ALVA and is sealed in a clear plastic blister with a foil backing). You may report serious side effects to the phone number provided under Questions? below. Gluten free. www.nauzene.com. Active Ingredients: In Each Chewable Tablet: Sodium Citrate Dihydrate (230 mg). Purpose: Upset stomach reliever. Inactive Ingredients: Aspartame, Glucose, FD&C Red 40 Lake, Flavor, Fructose, Magnesium Stearate, Maltodextrin (Corn Syrup Solids Contained), Silicon Dioxide, Stearic Acid. Directions: Consult a doctor for appropriate dosage. Chew tablets completely. Dosage may be repeated after 15 minutes, not to exceed 24 tablets in a 24-hour period unless advised by a doctor. Read all package directions and warnings before use and use only as directed. Nauzene chewables are intended for use by normally healthy persons only. Protect product from excessive heat, cold & moisture. Do not use if seal appears broken or if product contents do not match product description. 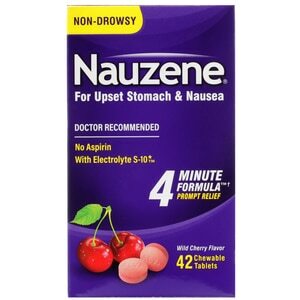 Note: Nauzene is not intended as a substitute for a balanced nutritional diet or as an electrolyte replenishment. Adults: 2-4 tablets. Children: Consult a doctor for appropriate dosage. Persons Under 18 Years of Age: Should use only as directed by a doctor. Warnings: Do not use: if you have Hereditary Fructose Intolerance (HFI). Ask a doctor before use if you have diabetes because this product contains sugar; are on a sodium-restricted diet; have phenylketonuria because each chewable tablet contains 4.5 mg phenylalanine. Ask a doctor or pharmacist before use if you are taking any other medications. This product may interact with certain prescription drugs. When using this product: do not take more than 24 tablets in a 24-hour period. Stop use and ask a doctor if: nausea lasts more than two weeks or recurs frequently. Pregnancy/breast-feeding warning: If pregnant or breast-feeding, ask a health professional before use. Keep out of reach of children. In case of overdose, get medical help or contact a Poison Control Center right away.